Sweetie the Thrill-seeking Van had quite the adventure today! 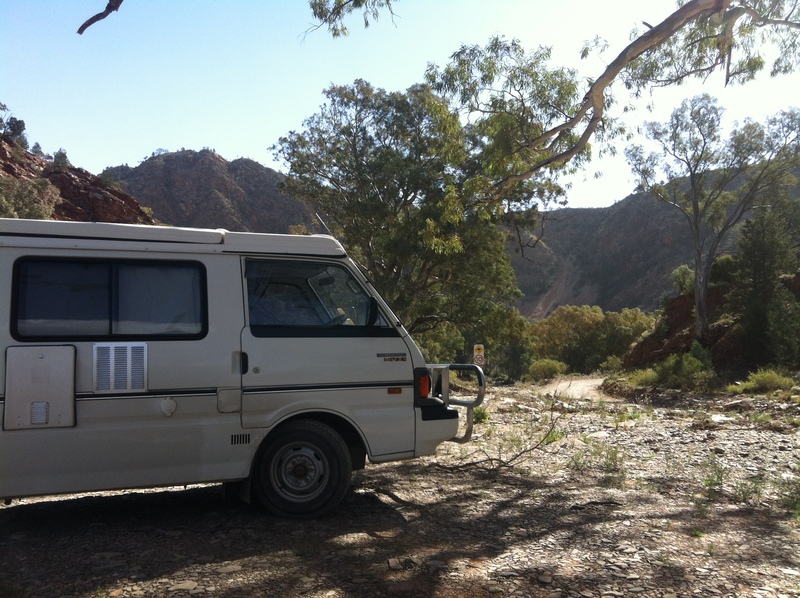 She may be a 2WD brick on wheels, but she handled the unsealed 20km long Brachina Gorge Geological Trail superbly. Okay, so we didn’t quite get all the way – a bigger pool in the track than I was willing to test out stopped us about 3-4km from the end, but it was a spectacular effort all the same. And we had to come back too! Being a gorge, a fair bit of it was crossing back and forth across creek beds and lots of twists, turns, rises and falls. 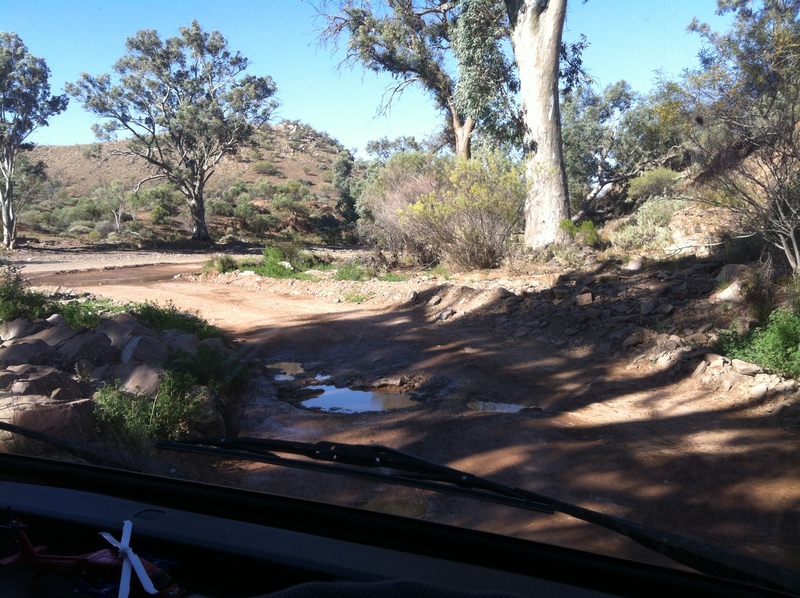 Potholes, washouts, the usual corrugations… hours of fun! (kind of). 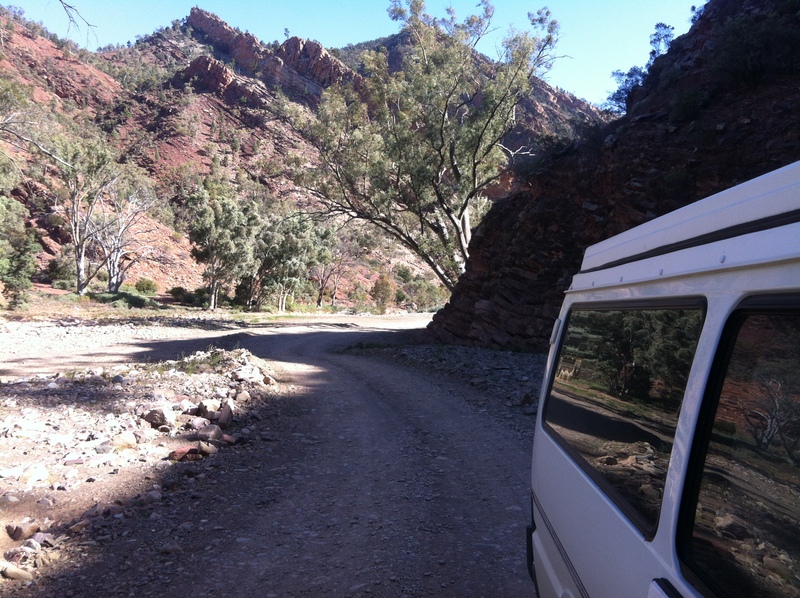 Known as a journey through the “Corridor of Time”, Brachina Gorge offers a unique and fascinating insight into the geological processes that created the Flinders Ranges. The gorge, and the track that follows it, takes the East-West driver from the oldest rock layer in the region (at a mighty 640 million yrs) through to youngest (a sprightly 520 million yrs). How you might ask? The 14 distinct rock layers, laid down over a span of 150 million years, are all tilted on an angle as a result of folding many millennia ago when the ancestral mountain range was first formed – a much higher mountain range than is evident today. With the tops of those ancestral mountains weathered down, what we’re left with is smaller ranges, formed of notably angled rock layers of a harder type – quartzite and the like. The softer layers that formed the original peaks have worn down. Someone with a more scientific mind, and more patience, would have gained even more out of the drive. If you had the time and inclination there are plenty of fossils to be seen. But in my defence, today’s weather really wasn’t very helpful! I felt like I was in a dustbowl – we had incredibly strong winds all last night and today, still howling now, with gusts I swear up to about 70kms an hour stirring up willy willys and dust storms all the way. Really pleasant!! Wilpena Pound itself is a bizarre and impressive structure in the central ranges. It is a basin surrounded by an oval ring of quartzite mountain peaks – 17km long and 7km wide – but is apparently a remnant valley floor from the previous much higher ancestral mountain range. The pound wall is made of rock layers angled up and in towards the pound centre – really quite bizarre to see all the angled rock layers around here, it’s actually made me feel dizzy on more than a few occasions. According to the dreaming stories, the pound was created by two serpents who ate a whole corroboree full of people then laid down feeling too fat to do anything (or something to that effect!) and formed the ridges. I did the self-guided challenging hike up the outside of the Pound wall towards St Mary Peak – the highest peak of the whole Pound wall, and reputedly the head of the female serpent – and continued on inside the pound to complete the loop walk – total distance of over 18kms. I was so shattered by the end that I was incapable of doing anything for the whole of the next day and I thought my feet would fall off. 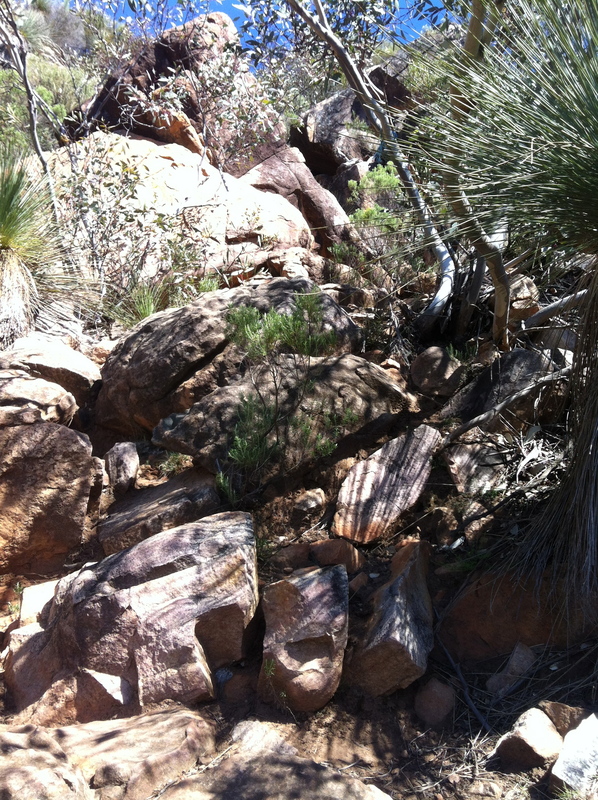 But I have to admit I didn’t go all the way to the summit – Tanderra Saddle was as high as I got. It was partly in respect of the wishes of the Adnyamathanha people of the area, who prefer that hikers do not go to the summit because of its cultural significance. But also because I knew that extra 3.2 kms diversion – making the total loop walk 21.5kms – might just have been the finish of me. It was a wise decision, judging by the pain in my feet and general state of health by the time I got back to Sweetie! But having bought a postcard of the view from the summit, I now appreciate what I missed out on. That’s the ‘path’ believe it or not! 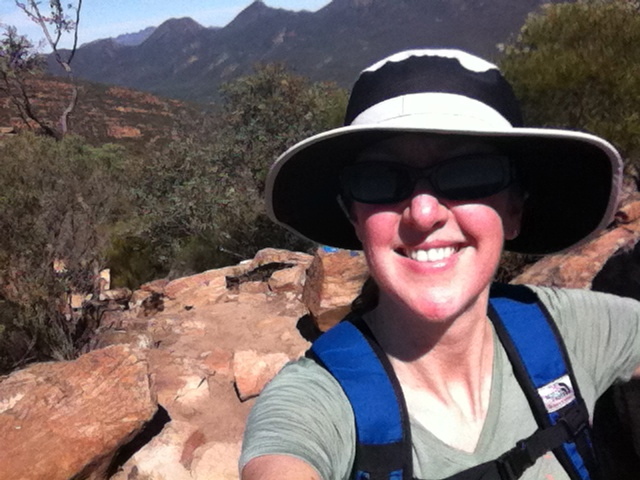 When I reached the Tanderra Saddle – after a tough climb (definitely not a walk!) up rock layers for the previous 1km of the 6km ascent – I stopped to have some lunch near a couple who had just been ahead of me and were debating whether to continue to the summit. They had come underprepared – were eating the last of their food, and had less than a litre of water left between them to complete at least 6kms more if they went straight back or 9.2kms return if they continued – but the bloke in particular didn’t seem to like the idea of having come this far and still not got to the top. (so goal-oriented!) I half-jokingly suggested that like me they could say they were respecting the wishes of the traditional owners and therefore feel justified in turning back, but he replied “it belongs to all of us, I’ll climb it if I want”. I took his point, but I don’t think he got theirs at all. And I think me saying that actually made him doggedly determined to do it just to prove his point. So off they went. crazy folk. Prior to heading to the Flinders Ranges, I visited the Wadlata Outback Centre in a Port Augusta – an extraordinarily good experience, which prepared me for my adventure. The walk through exhibition centre housed within the visitor centre outlines the geological, cultural, social, economic and natural history of the region, and is extremely well done. Well worth a visit – highly recommended. 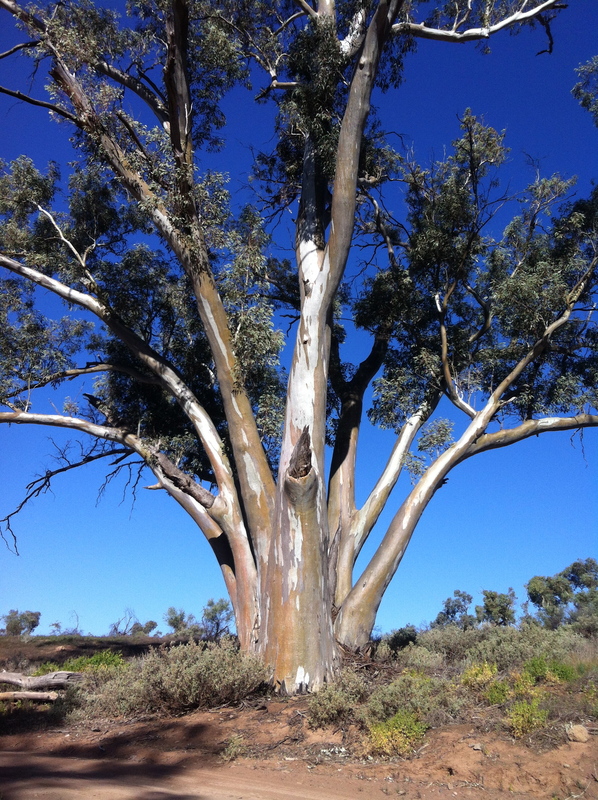 Whilst in Port Augusta I also visited the Australian Arid Lands Botanic Garden – a real gem of a place. If/when I ever put down roots and am establishing a garden, I will certainly be looking to their demonstration gardens for ideas of waterwise (AridSmart as they call it) plantings and combinations I could put together. One thing has eluded me so far in my travels in this part of the world – a siting of the Sturt Desert Pea in the wild (or anywhere but photos for that matter!). I don’t know why I’m so obsessed with this plant. I’m wondering if it’s because when we did our family trip through SA in 1980, I knew that it was the state floral emblem (school project maybe) and maybe we didn’t see one? 32 years of expectation is weighing upon me here… apparently they are most likely after rainfall, but there hasn’t been much of that round here if today’s dust storms are anything to go by. This entry was posted in Uncategorized and tagged Australia Arid Lands Botanic Gardens, Brachina Gorge, Flinders Ranges, Wadlata Outback Centre, Wilpena Pound. Bookmark the permalink.